Login where you can find various settings to enable the extension. 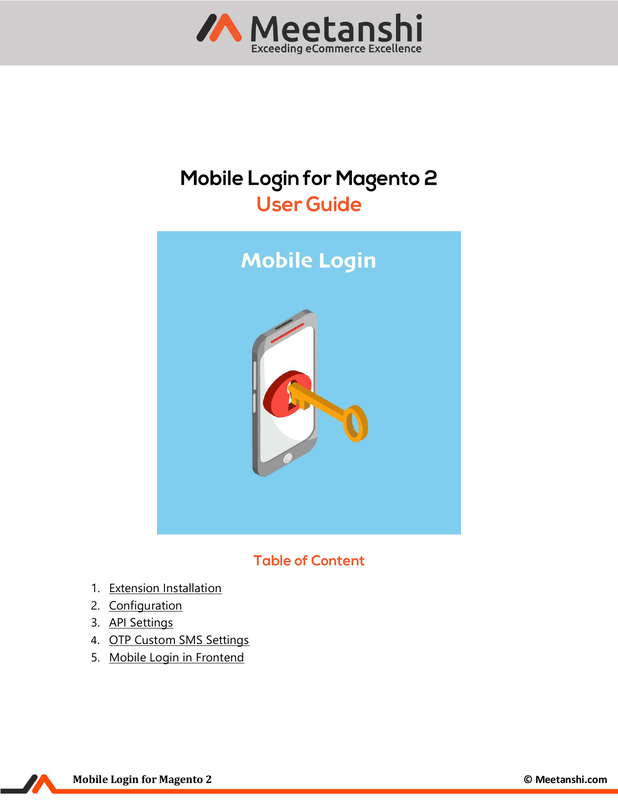 Mobile Login: Enable the Mobile Login extension. OTP Type: Set the OTP type from the drop-down menu. OTP Length: Set the OTP length. Sender ID: Add the sender ID. API URL: Add the API key received while registration with the SMS gateway. Configure the following OTP SMS settings for Mobile Login for verification with OTP. Login with OTP: Enable customer login with OTP. Login OTP SMS Text: Enter SMS text to send OTP for login. Registration with OTP: Enable customer registration with OTP. Registration OTP SMS Text: Enter SMS text to send OTP for registration. Forgot Password with OTP: Enable reset password with OTP. Forgot Password OTP SMS Text: Enter SMS text to send OTP for reset password. Update Mobile Number with OTP: Enable customer mobile number update with OTP. after OTP verification, as shown here. enter OTP for registration and verify the mobile number. The user can verify the mobile number using OTP for registration or opt for OTP again. opts for the forgot password button. Once the mobile number is verified, the user can reset the password as shown here. section after the mobile number verification.